I'm a total sucker for good lip glosses so I was so excited to find these at Sephora weeks ago. These are LORAC's new "Multiplex 3D" Lip Glosses. I can honestly say that they have everything that you look for in a gloss and I can't find one flaw about them (except for maybe if a color is wrong for you.) These little babies are uber moisturizing, highly pigmented, smell nice, and packed with LOTS of gorgeous shimmer -none of that crusty flaky shimmer either. So if you're not a fan of shimmer, skip these. If you are, keep reading!! 1. Cliché- Bright fuchsia with a hint of lavender and tiny blue sparkles. 2. Vivid- Medium pink with a hint of coral packed with gold and pinky sparkles. 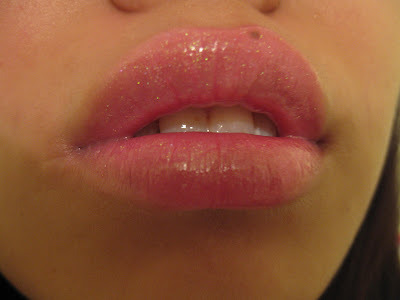 When applied to the lips, both glosses looked really "glowy" (like those glow-in-the-dark looking glosses that shift from yellow to orange to pink) but after I spread it out evenly, the "glowiness" effect disappeared. They made my lips look full and pillowy -without the tingly effect (these aren't even lip plumpers.) All the colors smell the same -like some sort of tropical fruit. They're not sticky yet not too non-sticky that they fade off your lips too quickly. I love that the glitter in these does NOT look gritty and that the glosses don't dry out my lips. 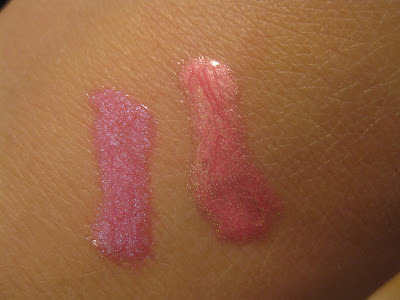 This gloss does not seep into my "dry winter lips" leaving cracks -it moisturizes. Seriously, this is what Too Faced "Girls Dig Pearls" gloss was supposed to be and what MAC Dazzleglasses wish they were (and I adore Dazzleglasses.) They're also longlasting. Even when the glossiness starts to fade, the "background" color leaves sort of a stain and lasts for hours. You can also build up the gloss for a more "multiplying 3D" effect. And here's a "full face" photo. Not sure why I looked really "shocked" here. One last thing. Cliché looks a little sheer in this picture, but the next day when I wore it again, it had a totally different effect. My lips were full on fushcia and when I tried to take it off (it was a little too much for school), I was left with a fuchsia lip stain that wouldn't go away for hours. This stuff is pretty intense so beware of that if you're more of a "toned down" type of gal. Though I've only had it for a few weeks, this has already been updated to my "Top 5 Lip Glosses" list. 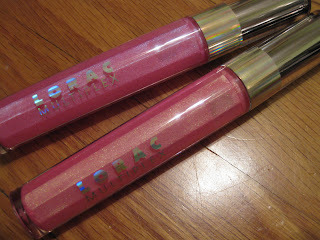 Have you tried LORAC Multiplex 3D glosses? How do you like them? Ooh, jealous! These both look amazing on you -- especially Cliché. ♥! Thanks Rae! I definitely recommend grabbing one. I just bought "Polished" too and will post swatches of all the colors either today or tomorrow. i suggest wetslicks by covergirl, they smell amazing (my personal fav is guava splash). Thanks for the suggestion. =) I can't remember if I've tried this yet (might've a few years back) but will pick one up next time there's a CVS Cover Girl sale. I love 3D Lipgloss, my fav is Bourjois! Want to stay glamorous? Apothica offers Bobbi Brown makeup for gorgeous girls. Apothica's other brands also include favorites like Shiseido, Smashbox, & Too Faced! COPYRIGHT: It is plagiarism to take any content including photos and and written work from The Makeup Drawer without my knowledge. If you would like to use my photos, please let me know beforehand and link the post that the photo is from. Photos of my family and friends are off limits and may never be taken from this site. With the exception of the above statement, the content of The Makeup Drawer should never be featured on any other blog or website. 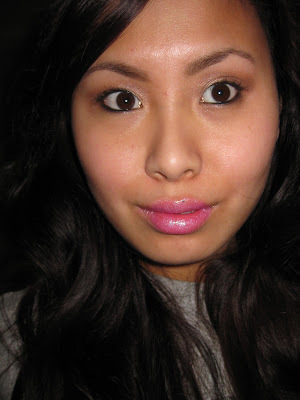 Also, I can only be found on Blogger and (very rarely) on MakeupAlley and Specktra. I do not have a LUUUX, Facebook, Twitter, or any other blog or website.